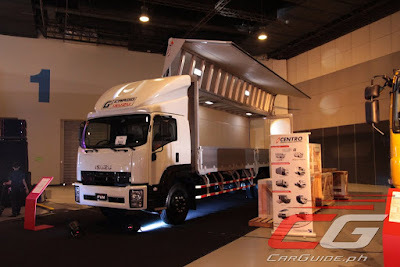 Centro Manufacturing Corporation has partnered with Japan’s and the world’s number one wing van manufacturer, Nippon Fruehauf Company Ltd. to locally manufacture and assemble the wing van. For this, Centro has recently inaugurated its new manufacturing and assembling facility in its plant at Marilao, Bulacan in the presence of DTI secretary Ramon Lopez, Marilao Mayor Juanito Santiago, Nippon Fruehauf President Koji Ueno, Isuzu Philippines Corporation President Hajime Koso, and Centro President Raffy Juan. The plant has a rated capacity of 25 wing vans a month on a single shift. DTI Sec. Lopez was actually instrumental in putting together this project, which took all of only six months to put in place. He arranged for the Centro-Nippon Fruehauf Agreement to be signed in Japan in the presence of President Rodrigo Duterte during his State Visit last October 2016. This was reaffirmed when Japanese Prime Minister Shinzo Abe visited the Philippines last January 2017. The plant was constructed then inaugurated last April 21, 2017. Nippon Fruehauf President Ueno said that he was pleased to have partnered with the leading truck body builder in the Philippines for this venture. He cited that his company is known for innovating and creating new products that revolutionized the freight and logistics industry. “In 1914, our founder August Fruehauf invented the trailer for a Ford Model T car. That spurred the growth of the freight industry in the US. In 1963, we invented the dry van and the refrigerated van. This was followed by the invention of the wing van in 1969. All of these new products made moving cargoes easier and cheaper in Japan and across the seas to the rest of the world. These products are basically game changers”. Centro President Juan explains that this wing van is a new product that will revolutionize the way we will transport goods across the Philippines, as the logistics industry can now move more cargoes at a lesser cost. “For our company, we will benefit from the ensuing transfer of new technology and our learning from the best manufacturing practices of our Japanese partner. We are deeply honored to having partnered with the best and the biggest wing van manufacturer in Japan and in the world”. In its debut appearance at the recent 2017 Isuzu Truck Fest, Isuzu Philippines Corporation (IPC) presented its Isuzu G-Cargo wing van made by Centro and Nippon Fruehauf. Mounted on an Isuzu FVM cab and chassis, the G-Cargo wing van is made of aluminum which is light in weight yet strong and durable. The wing roof is ultra-light weight in design using 6000 series aluminum posts and 5000 series aluminum panels and uses a hydraulic system, the time-tested Fruehauf power unit that has passed opening and closing test of 27,000 cycles and operates at the touch of a single button. It also features Seiko locks for the gate lifters to make operating the drop sides more convenient, side bars for added protection and accessibility and an air deflector for better aerodynamics and fuel efficiency. For added safety, it is equipped with an immobilizer that prevents the engine from starting when the wing roof is open even when the ignition key is turned on.